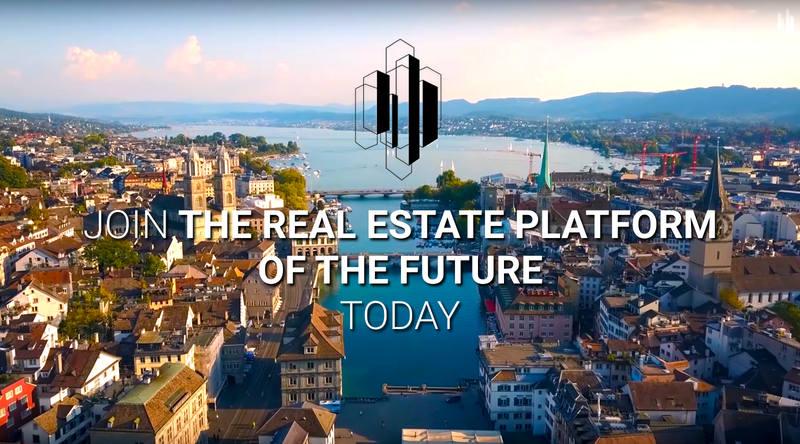 An innovation from ‘Crypto Valley’ in Zug, Switzerland, is generating a buzz: blockimmo is a real estate transaction platform based on blockchain technology. The company enables joint real estate investments through crowd sales, thereby lowering the barrier to entering this attractive investment class. The platform is easy to use and offers maximum investor protection. The real estate transaction platform blockimmo has been online since December 2018. Investors can invest in properties with small amounts starting at roughly CHF 1,000. On the other side of the transaction, property owners can garner best prices for the sale of their real estate. ‘I’m very proud to have launched a secure blockchain product for both private consumers and professional investors with blockimmo,’ says founder and Managing Director, Bastiaan Don. blockimmo offers investors a simple way to invest in a lucrative and exclusive market. Blockchain investing utilises the concept of a digital wallet: at blockimmo, an investor takes part in a crowd sale of a property using their own personal wallet. blockimmo currently supports all major wallets, both on desktop and mobile as well as the two established hardware wallet providers Ledger and Trezor. The investors can decide how much they wish to invest in a property and follow the progress of the crowd sale live. Once the sale has been formalised, the investors receives their shares in the form of tokens in their wallet. The tokens represent shares of the underlying real estate. After the successful sale, investors enjoy a regular stream of revenue from the properties and their increasing value. ‘There is no minimum investment on our platform, but we find that investments upwards of roughly CHF 1,000 make the most sense,’ says Bastiaan Don. Moreover, investors can sell their investment at any time and without brokerage services — either through peer-to-peer sales (via the bulletin board) on the blockimmo platform or directly through a regulated exchange. Beyond high liquidity, this blockchain-based technology also offers high flexibility to investors — another advantage over existing real estate transaction platforms in the ‘conventional world’, where joint owners of a property generally have to be entered in the land register. Furthermore, in conventional arrangements, the other joint owners have a legal right of pre-emption, which greatly increases the potential for conflict — to say nothing of the high legal complexity and lack of investor protection. The Zug-based law firm MME, an established player on the blockchain scene, and Liechtenstein-based Bank Frick are supporting Bastiaan Don with the launch of the platform. ‘With the first regulated, token-based real estate investment fund in the world, Bastiaan has set an important milestone in the development of blockchain technology. The implementation of projects like blockimmo demonstrates the expertise of Bank Frick. in the field of digital business models and products, as well our innovative drive,’ says Raphael Haldner, Director of Funds & Products at the family-run bank. To ensure the greatest possible security for investors and sellers alike, the blockimmo platform (build on the Ethereum Blockchain) was also thoroughly put through its paces by the IT security firms New Alchemy and Hosho as well as the Public Bug Bounty Program via HackerOne prior to going live. Starting in the first quarter of 2019 at the latest, blockimmo will also offer other trading options that have been difficult or impossible to conduct until now. Examples include the partial sale of properties and crowd sales by auction. In the latter case, the investors can personally decide what the property is worth to them. This also benefits the property seller: with the investors setting their own price for a property, the seller is guaranteed to achieve the best possible price above their own minimum demand. ‘This represents a novelty in the real estate sale process unseen on the market to date,’ says Bastiaan Don. Bastiaan Don: ‘We explain, for example, that the properties we tokenise are already designated with the precise E-GRID number directly in the blockchain. This is already a known quantity in Switzerland and they are already entered as such in their own, centralised land register. Synchronising the systems would be a first step towards a land register on the Blockchain’, envisions the blockimmo founder.